Their space travel is conceived by the filmmakers in a way that is not only charming but kind of lovely. Jimmy converts some of the rides in an amusement park into spaceships, and we see a Ferris wheel, an octopus ride and a merry-go-round journeying across the field of stars. In another inspired conceit, they stop for the night on an asteroid, build a campfire, and frighten one another with campfire ghost stories. 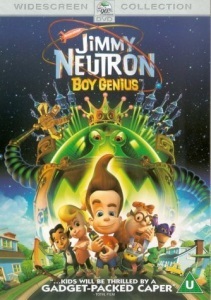 "Jimmy Neutron: Boy Genius" is a Nickelodeon production, frankly aimed at grade-schoolers. It doesn't have the little in-jokes that make "Shrek" and "Monsters, Inc." fun for grown-ups. But adults who appreciate the art of animation may enjoy the look of the picture, which is a kind downsized "Toy Story," with a lot of originality in the visual ideas. I have no particular hatred for Jimmy Neutron, but everything about it screams "CGI Movie before CGI was ready for prime time." Because of this, it's particularly jarring to see Ebert mention Shrek and Monsters Inc in the same same sentence, as those are both (for better or worse) classics of computer animation. Jimmy Neutron pushed the boundaries for how low-rent a CGI feature from a major studio could look. It's telling how quickly the movie rolled into a TV series that looks virtually indistinguishable. It also approached the Uncanny Valley problem a lot of early CGI had by leaning hard into making everything look plastic and cartoony. This approach was then copied by a lot of other studios, including ones that really ought to have known better, to the detriment of good animation everywhere. So like I said, I have no particular hatred of Jimmy Neutron, but I knew it for what it was at the time and the time since has not been kind to it.